Roma Downey is back in the dove business. One of the winged creatures–a Christian symbol of peace and love–prominently ended each episode of her hit 1994-2003 series Touched by an Angel. And now she and her husband, Mark Burnett, are executive producers of The Dovekeepers, a CBS miniseries based on Alice Hoffman's novel about courageous women in the doomed Jewish fortress of Masada. "I think of this little dove connection as a wink from God," says Downey, who also uses the sacred bird as a logo for her faith-based film and TV company, LightWorkers Media, which produced the hit History miniseries The Bible and the upcoming NBC series A.D. The Bible Continues. "I am devoted to stories where love and beauty shine and the human spirit endures," Downey says. "There's no more stunning example of that than the tragedy that took place at Masada." According to accounts by Jewish historian Josephus (played here by Sam Neill), this mountaintop community in the Judean desert was the site of a mass suicide circa 73 CE. More than 900 Jews who had come there seeking safety chose to die as martyrs rather than be killed or enslaved by the Roman army. (Only two women and five children were said to have survived the siege.) Downey read Hoffman's best-selling 2011 take on the event, with its fiery feminist slant and heady doses of romance, scandal, and witchcraft, during a flight to Europe, and she had an emotional meltdown. "I sobbed the whole way there, so badly that I had the flight attendants worried," she says. "On top of that, there was a photograph on the book cover that was called 'The Lightworkers.' I mean, what are the chances?" Downey quickly arranged a meeting with Hoffman to secure the rights, then approached CBS Entertainment president Nina Tassler in hopes of getting The Dovekeepers on the air. Coincidentally, Tassler had just returned that very week from a trip to Masada and had been profoundly moved by the experience. "And that," says Downey with a laugh, "is how quickly a deal gets done in Hollywood when you have a little divine help!" The two-night mini, filmed in Malta, heralds the return to TV–and CBS–of the immensely popular Cote de Pablo, who abruptly left her eight-year gig as Agent Ziva David on NCIS in 2013, upsetting fans, network execs, and costars alike. "It was the best gift I've ever given myself," de Pablo says of her exit. "I needed time away from acting in order to get back to living. It's not easy to leave comfort and security, but I never feared I was doing the wrong thing. I needed to let my heart grow." The Dovekeepers, she says, "reminded me that my passion for acting was still massive and alive. I also saw this project as a way of honoring my own upbringing." De Pablo plays Shirah, a powerful mystic and healer who has a child out of wedlock with Eleazar Ben Ya'ir (Mido Hamada), a revered leader in the Jewish army, whom she follows to Masada. "I felt deeply connected to the magic in the story," says the actress, who was born and raised in Santiago, Chile. "We were a very Catholic, conservative, traditional family, in church ­every Sunday. But once a year–just to cover all the bases–my grandmother would take us to the local witch, who dealt in positive healing powers. It was never regarded as taboo." It's Shirah's job to tend to the doves of Masada–their excrement is used as fertilizer–with her teen daughter, Aziza (Finding Carter's Kathryn Prescott), a tomboy warrior who has lived much of her life disguised as a boy. Joining them in coop duties is the haunted Yael (House of Cards' Rachel Brosnahan), whose vivid red hair, which she regards as a symbol of blood, is a painful reminder that she "killed" her mother in childbirth. 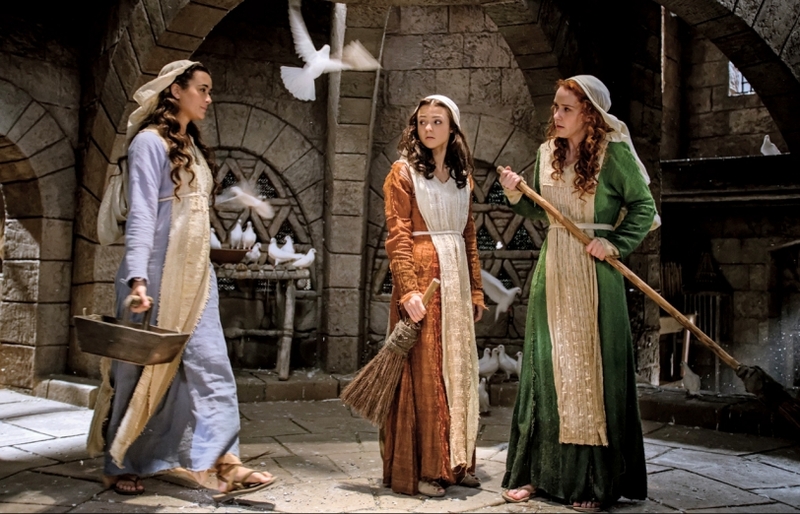 "The Dovekeepers is history retold from a female perspective," Prescott says. "These are women who are not OK with being thought of as second-class citizens. They are as strong-minded as the men of Masada and real fighters." Says Brosnahan: "It's so easy for us to think of life today as hard and complicated, but it's a picnic compared to the lives of these women, where danger and oppression were a day-to-day thing." But this saga is not without its male appeal. Mexican-born actor Diego Boneta (Rock of Ages), who plays ­Masada's star swordsman, Amram–Aziza's beau and Yael's brother–says it's "a remarkable experience to get inside the minds of men who know they are going to die." The battle sequences, staged by Jean Frenette (300), are "extremely cool and exciting," Boneta says, "but the story is so much bigger than the Jews' fight against the Romans. It's about the fight for love. When my time comes, I sure hope I go out as honorably."